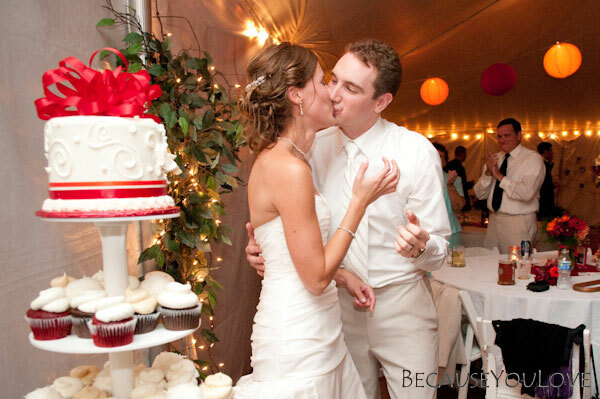 When we first considered desserts, we envisioned a rustic assortment of cakes and pies. 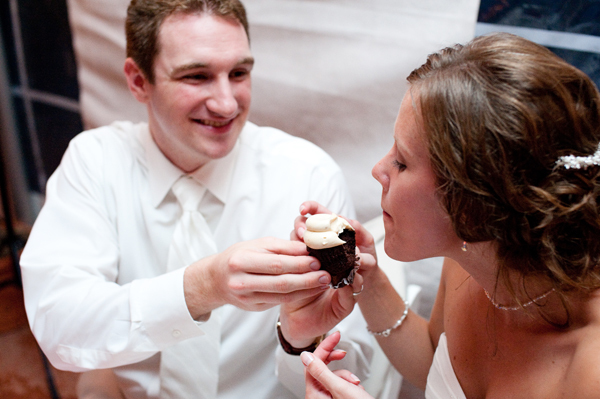 And then we tasted cupcakes from Providence Divine Cakes and Pastries in York, Pa. “Divine” is the perfect adjective to describe the moist, flavorful cake and the swirl of sweet buttercream on top. Naturally, our plans changed. 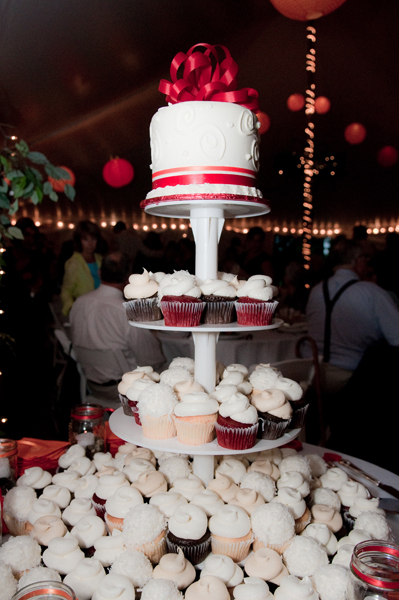 There’s a reason why cupcake towers are a wedding trend. 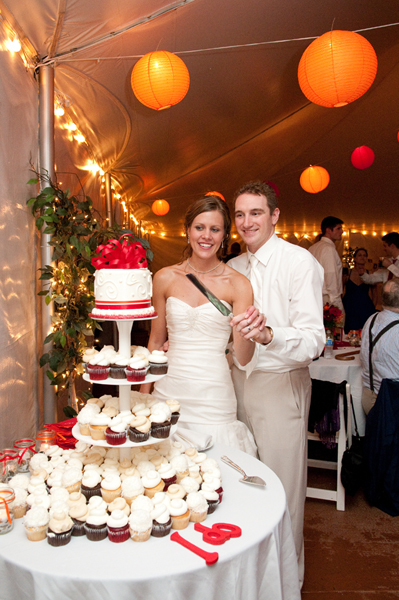 They enable the bride and groom to select a variety of flavor combinations, there’s no additional cost to “cut the cake,” and the display is just so darn cute. The cupcakes tumbled down the three-tier display (provided by the bakery) and onto the round table alongside our Gocco’d napkins. For our 6-inch round cake topper, we chose a white cake brushed with Chambord and layered with raspberry Champbord preserves and mousse. Yum! 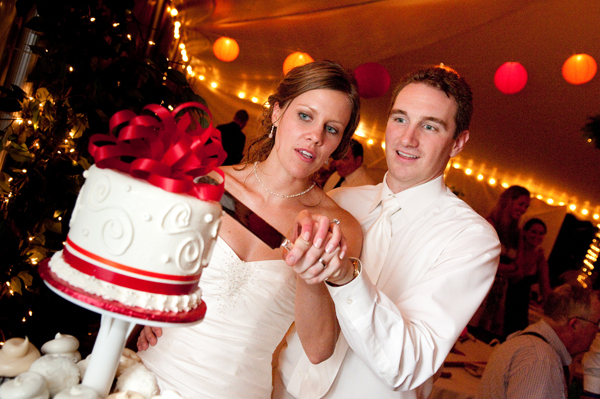 To the tune of “How Sweet It Is,” by James Taylor (predictable I know, but he is truly one of my favorite artists), we sliced into our wedding cake with an engraved Lenox knife given to us by my parents. The red and orange ribbons looked oh so pretty, but proved to be a hazard. 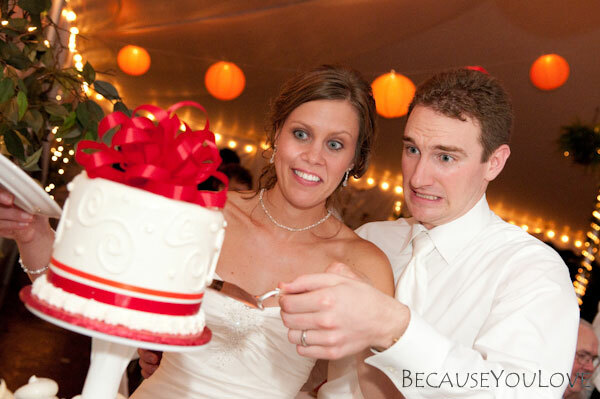 As evidence from this perfectly timed shot, we both thought the cake was going to topple off the pedestal and onto the ground. 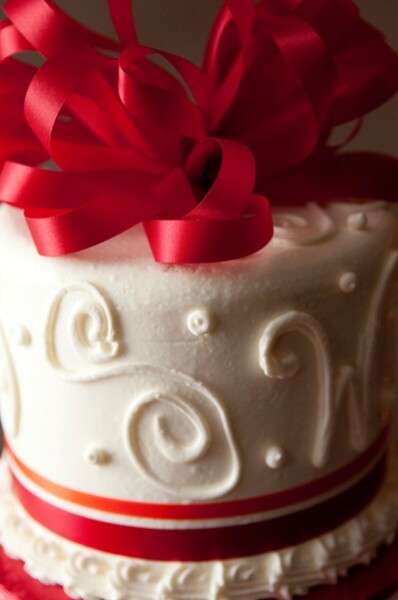 Fortunately, Providence provides a complimentary cake for our first anniversary. We won’t be in town to pick it up this weekend, so we plan to have a belated celebration when we’re home for Labor Day! 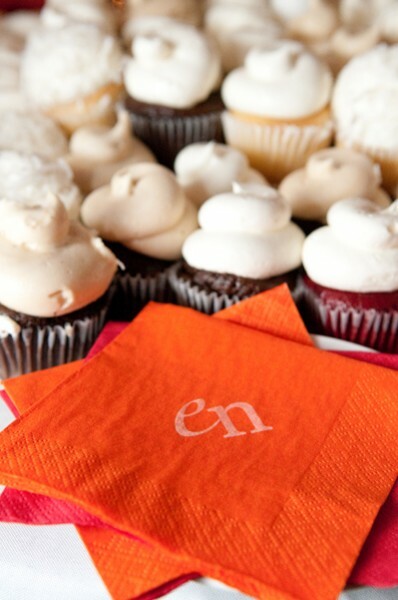 Considering how fast the cupcakes disappeared from the table, I’m glad we grabbed one to share when we did! Chocolate cake with peanut butter frosting, of course. (a) YUM! Now I want a cupcake! and (b) Love your music choice… How Sweet It Is was our first dance (we have odd, “non-first-dance-appropriate” songs that are “our” songs, and we figured “heck, who doesn’t love James?”) and was emblazoned on our take-home cookie bags! Love James! In fact … I’m co-hosting his local PBS pledge show performance next week. Pitch is supposed to be targeted to “Boomer women.” Glad to hear I’m not the only one outside of that category! Oh my gosh, I love the display! We are doing cupcakes too but I’d never thought of doing our little cake like that, at the top. I’m going to e-mail this to the bakery that’s doing ours (they’re new, but she’s been doing really nice cakes out of her home for awhile). Um, I’m so hungry now. Peanut butter frosting is one of my top ten reasons to wake up in the morning, I’m pretty sure 😉 I wanted to do cupcakes for our wedding; I can’t remember why we chose not to in the end. The cupcake towers are SO CUTE! By the way, have you tried the cupcakes from *ndulge? They are phenomenal. I have tried ndulge, and I’m anxious to try Sugar on Top, too. Figures. I leave State College, and two cupcake shops open! I work just about a block up from ndulge, so I grab them on my way out of town or at lunch. (In fact, I just picked up a “six-pack” for my cupcake-obsessed husband!) But I still need to try Sugar on Top, too. 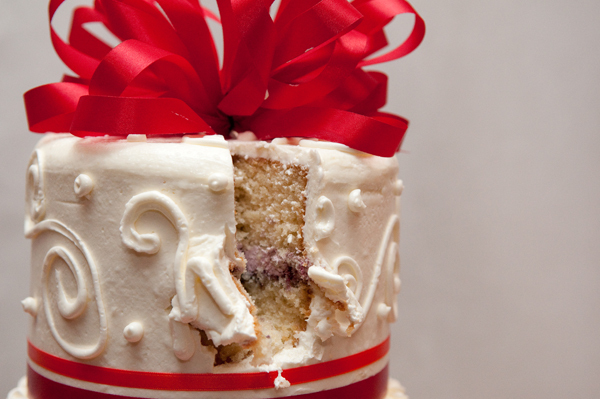 There is nothing better than REAL buttercream. Oh man, I want a cupcake!